You know Auto-Tune - the effect made famous by the likes of T-Pain, Cher, and Kanye West. Integrated time correction and manipulation: Auto-Tune 7's time control capabilities combine a high-quality time shifting algorithm with an intuitive user interface designed to make it quick and easy to correct timing errors or exercise your creative imagination. 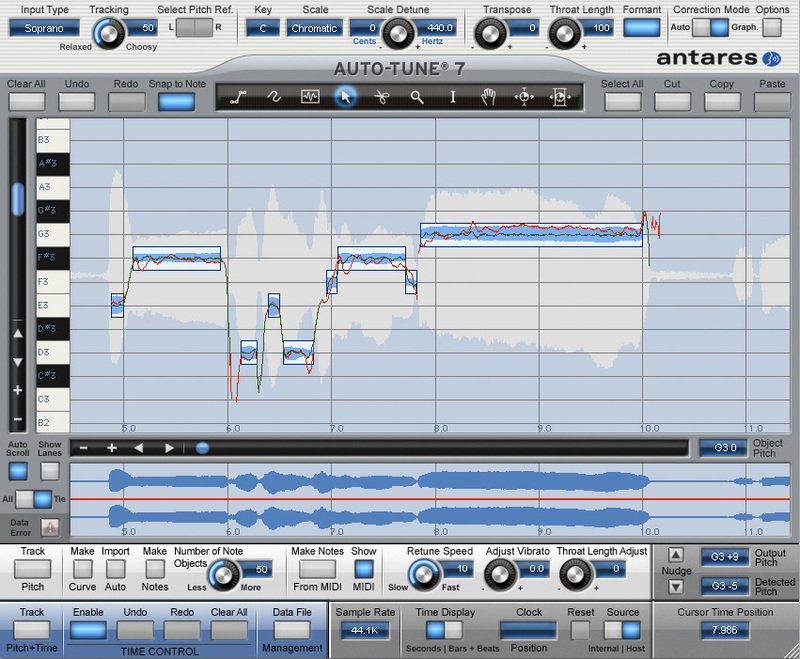 Auto-Tune 7's time manipulation functions include the ability to move a point in time within a selected range as well as move a range in time within a larger range. The nondestructive time functions have their own Undo/Redo controls independent of the pitch correction controls and an Enable button that allows users to instantly switch between their original audio and their time shifted audio. Evo Voice Processing Technology: In 2008, Auto-Tune Evo introduced Antares' Evo Voice Processing Technology for pitch detection, pitch shifting, and formant processing. In the intervening years, Evo Voice Processing Technology has been integrated into Antares' full line of vocal processing tools. Now, with Auto-Tune 7, Antares is introducing the second generation of Evo Voice Processing Technology, offering even more natural pitch shifting and throat modeling over a wider transposition range. Create target notes from MIDI in Graphical Mode: When tracking pitch in Graphical Mode, Auto-Tune 7 will record any MIDI note information routed to it (either from another MIDI track or live from a MIDI controller) and (optionally) display the data on the Pitch Graph Display. One can then use the new Make Notes From MIDI function to convert the MIDI information into Note Correction Objects. Perfect for fine-tuning the Auto-Tune Vocal Effect or even completely redefining melodies. Adjust Throat Length on an individual correction object basis: To give users maximum control over the timbre of their vocal tracks, Throat Length Adjustment is now an independent property of each individual correction object (Curve, Line or Note). While the overall Throat Length is still set by the master Throat Length knob, each correction object can have its own independent adjustment (either longer or shorter) as desired. Enhanced Amplitude Envelope Display: Whenever time control is enabled, the Amplitude Envelope Display will display both the original audio and the time-shifted audio, updating in real time as edits are made. So users will always be able to see at a glance the results of their time edits relative to the original audio. Enhanced Graphical Mode Adjust Vibrato function: Auto-Tune 7's new Adjust Vibrato let's users modify the depth of any natural vibrato in their original performance. And since it is additive, acting on any already existing correction object, they are free to work on pitch correction and vibrato adjustment in any order desired. Expanded keyboard shortcuts: Auto-Tune 7's Key Binding system has been expanded to allow custom keyboard access to the new time manipulation tools and controls. Smooth continuous scrolling of graphical audio data: With Auto Scroll enabled in Graphical Mode, the graphical data will scroll smoothly across the screen during playback, maintaining the currently playing audio at the vertical center of the window. The option to display the graphical timeline in bars and beats: Primarily designed as reference for time manipulation, users can now display the graphical timeline in either absolute time or as bars and beats relative to your project's tempo. Increased vertical zoom range in Graphical Mode: For ease of extremely precise pitch editing, one can now zoom all the way in to the one-cent-per-pixel level. New Flex-Tune feature lets you set the rate at which Auto-Tune corrects pitch. Workflow is now easier to use and more customizable, designed to enhance your recording experience. Selecting either smooth scrolling or screen-by-screen scrolling when Auto-Scroll is enabled in Graphical Mode. Added a smooth scrolling delay parameter for optimizing smooth scrolling performance. Bugfix for a problem involving the detection of whether session data being loaded was saved from a 32-bit or 64-bit session. Bugfix for a session compatibility problem between 32-bit and 64-bit sessions that contained saved graphical correction objects. Bugfix for a problem that could result in a potential crash when drawing correction objects. Bugfix for a problem that resulted in time-warping not starting and ending at the correct locations.